Unbeknownst to most, a small but aggressive invader is lurking in the tranquil waters of Little Lake. For the time being, however, it seems to have met a roadblock in its attempt to expand and plunder waters to the north. The round goby (Neogobius melanostomus) is an invasive, bottom-dwelling fish that was first found in North America in the St. Clair River in 1990. Native to Eurasia, it is believed to have arrived in the ballast water of transoceanic ships. The goby has spread through all five Great Lakes and is now invading inland waters, including the Trent-Severn Waterway. Dr. Michael Fox and his colleagues at Trent University are doing important research on gobies and may have discovered evidence that the Trent-Severn invasion has been stopped. Where, you might ask? Right at Peterborough’s iconic Lift Lock. Round gobies are small fish, measuring up to about six inches (16 centimetres) in length. They have a blunt snout and a large, frog-like head, which gives them the appearance of a tadpole. They can be distinguished from all other Ontario freshwater fish by a pair of fins on the underside of the body that are fused together to form what looks like a suction disk. The tail fin is scallop-shaped, and the brown to olive body is covered with prominent, dark brown spots. The goby’s diet consists mostly of invertebrates found on lake and river bottoms. Mussels, in particular, are relished. These include invasives like zebra and quagga mussels, as well as native freshwater mussels. Many of the latter are species at risk. Gobies ingests zebra mussels whole, crush them with their teeth, and discard the shells before the soft body of the mussel is swallowed. Eating zebra mussels is not without negative impacts, however, and is linking the gobies to botulism type E. Botulism kills fish-eating birds like ducks, gulls, grebes and loons. The disease is caused by a toxin that is produced by the bacterium Clostridium botulinum. It is suspected that zebra and quagga mussels are ingesting the botulinum bacteria (invertebrates are not affected by botulism) and concentrating the toxins in their tissues. It appears that the toxins are then passed from zebra mussels, to gobies, and finally to fish-eating birds. A large percentage of dead birds in the Great Lakes that test positive for botulism have gobies in their stomach. Gobies have another troublesome habit. They eat the eggs and young of other fish. This makes them a serious threat to native fish populations, including game fishes. Most affected, however, are native bottom-dwelling species such as logperch, mottled sculpins, northern madtom and the eastern sand darter. Madtoms and sand darters are listed as species at risk in the Great Lakes Basin. Gobies also compete with native fish for food and spawning habitat. Being larger and more aggressive, they take over prime spawning sites traditionally used by small-bodied native species. They also lay more eggs than many native fish and spawn more frequently. To make things even worse, gobies are at an advantage in killing prey, since they can hunt in total darkness. Gobies are so successful that divers have found up to 100 fish per square metre of lake bottom in parts of the Great Lakes. 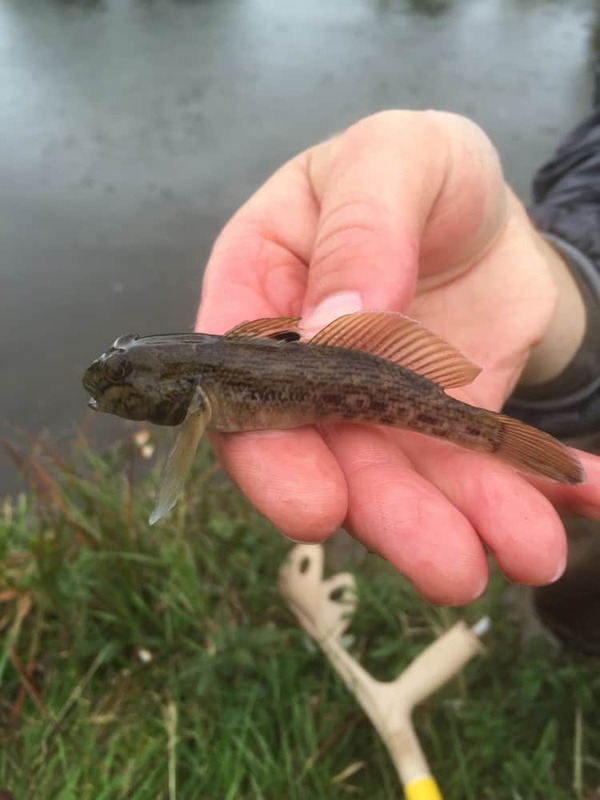 Much of the research on the round goby has been carried out by scientists at Trent University, including Michael Fox, Jacob Brownscombe and Masters student, Chelsea May. In research done in 2009 and 2010, Fox and Brownscombe were able to identify some of the variables of goby range expansion. For instance, they observed rapid range expansion during the non-reproductive season. These “pioneer” gobies tended to be smaller individuals and most often females when compared to gobies at other range locations. The newcomers also exhibited more of a preference for rocky bottoms at range edges than in areas where a goby population has existed for longer periods. It appears that range expansion occurs when some of the gobies are forced from occupied areas by competition with others of the same species. They therefore migrate in search of alternate, high quality habitats. A Trent study led by Emily Myles-Gonzalez, now a Masters student at Guelph University, found that certain gobies are predisposed to exhibit behaviors associated with dispersal (moving into new territories) such as boldness, a higher resting metabolic rate and even a predisposition to “explore”. Gobies such as these are more likely to be located along the invasion front – “to boldly go where no goby has gone before” – than at a location where the species has been established for a longer period of time. It’s almost as if the bold and brash gobies are up at the invasion front, while the more laid-back individuals are happy to stay home. Gobies in the Peterborough area have been able to advance to just above Little Lake but no further. The front has been stationary for two years. According to Fox, this may represent the first time a goby invasion front has been stopped in its tracks. There is no indication that the fish have advanced upstream past this point, either in the Canal or in the Otonabee River. 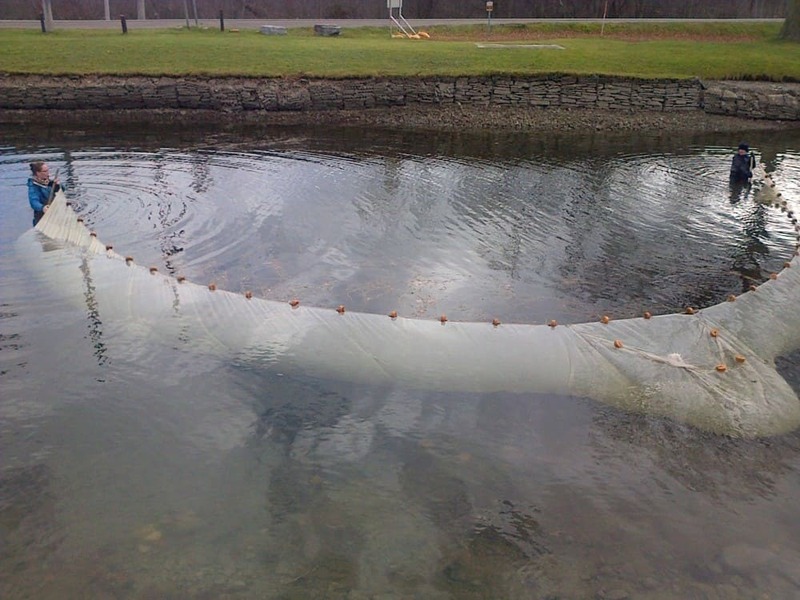 Chelsea May and her team carried out extensive searches using seine nets, minnow traps and angling, even as late as November, 2015. However, not a single round goby was found above Lock 20 at Little Lake. The apparent containment is probably due to a combination of an artificial barrier, namely the dam on the Otonabee River at London Street, and water management practises in the Canal. While there is no barrier in the Canal as such (gobies can pass through locks), the water level below the Lift Lock is lowered in winter to prepare the Canal for skating. A lower winter water level means less low dissolved oxygen for the fish to breathe. Gobies may be unable to survive in these conditions, unlike some of our native species like pumpkinseeds. As part of May’s Masters research, she will be testing gobies in the lab to see how well they tolerate hypoxia (low oxygen). It may be that low oxygen levels are forcing any fish in the canal at freeze-up to retreat back into Little Lake to overwinter. Asked why the gobies aren’t passing through the Lift Lock in summer, Dr. Fox said that small numbers may indeed get through, but not enough to establish a reproducing population. Once round gobies are introduced to a new location, they can expand on their own. This may happen inadvertently when anglers use gobies for bait and then release them live in waters they do not yet inhabit. This is the most likely scenario for future goby expansion in the Trent-Severn Waterway. It is important to never buy or use round gobies as bait and never to release baitfish of any kind into lakes and rivers. If you find a round goby in the wild, please contact the toll-free Invading Species Hotline at 1-800- 563-7711.